One set of two pillows, a pack of 48 assorted note cards plus a hand painted silk scarf. 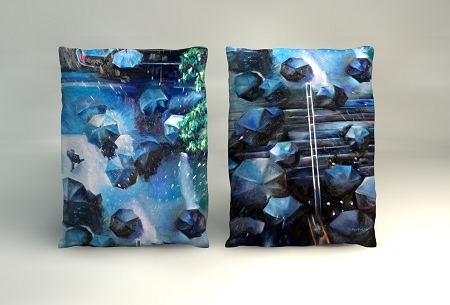 Pillows: The images are printed on pillows made of imported Belgian linen. The fabric is doubled with an inner lining and closes with an invisible zipper. The pillow is filled with down feather. These particular pillows measure: 18 inches x 24 inches each. Since the original painting is long, the image on the silk pillow wraps around the other side. The image shown is demonstrating both sides of the pillow. 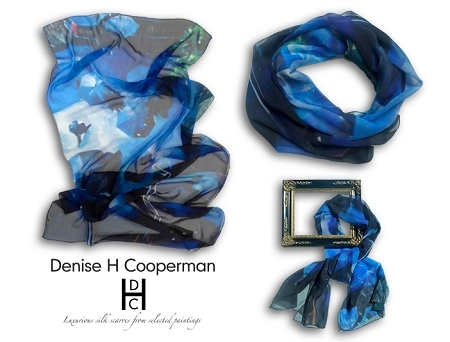 Scarf: The hand painted silk scarf is 28 inches x 72 inches. The scarf is made of silk charmeuse, hand rolled edges and hemmed. Dry clean only. The original oil painting which was replicated in the pillows, silk scarf and note cards was inspired from a rainy day in the city with a uniformity of black umbrellas. We all share rain and have that in common. We all experience it in every part of our planet.